Throughout our studies of Puy d'Issolud, we have collected many legends, some of which relate to the siege of Uxellodunum in 51 BC. The photos below are from the archives of Antoine Laurent-Bruzy and Armand Viré. Between the Piles and the Roc Rouge, you descend below the rocks of Ambarre on the path known as Labro's passage. 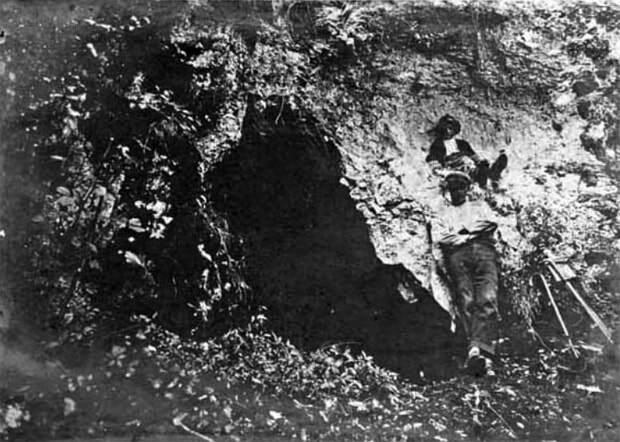 Nearby is an excavation consisting of two caves or "bouffias" known as Los Crosos Poudrieros (or croze Poudrière), in the centre of the rock, facing south (Fig. 1). "A young girl, Jeanne de la Rive, loved being in the cavern, she grew vegetables and flowers there. One day, and it was the work of evil, the rock closed behind her. There was great distress because she could be heard moaning throughout the mountain. So all the people left Vayrac in a big procession to release her. The rock parted far enough to let Jeanne out. It is in memory of her deliverance that a cross was planted on the high rock called Piles which dominates the plain at a height of over 100 meters." 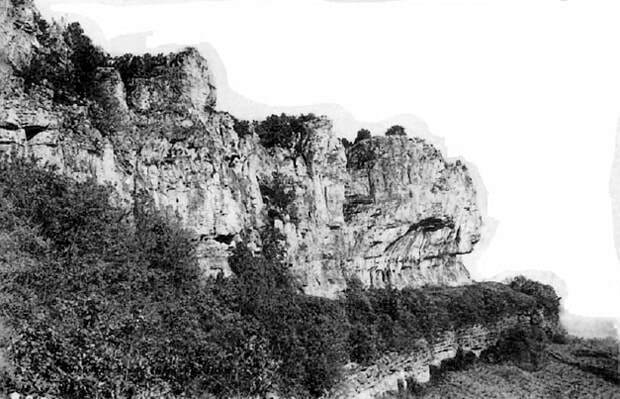 A long-standing legend is linked to the proximity of the river Dordogne on the south side of Puy d'Issolud at the foot of the cliff: Centuries ago the water level reached the top of the embankment above the rocks of Ambarre, and at this point boats were moored (Fig. 2). To pay a toll for the benefit of the territory. There the Dordogne flowed fast..."
" In ancient times, they say, the waters rose to the height of the Puy d'Issolud rocks. The Romans came to moor their boats at the rock called Piles below the rock of Ambarre (Dzous Am barro) in the "Caverne de l'Hoste" (Lo Croso de l'Hoste)". The legend of the golden calf(4): "During the battle of Uxellodunum, the Gauls hid gold coins wrapped in calf skin in a well on the plateau of Puy d'Issolud". Another version of the golden calf, by Paul Bial(5): "There is, on the Puy d'Issolud, a calf skin full of gold coins hidden somewhere at the foot of a white bush." 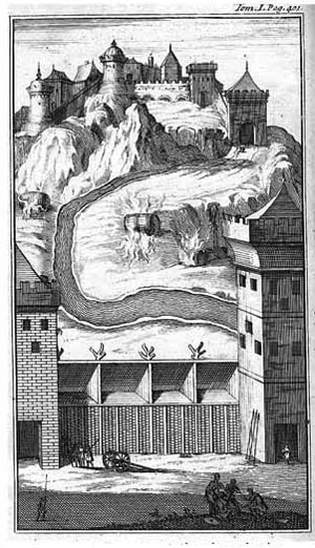 A legend tells of a Roman gateway(6): "At the very tip of the oppidum, facing the hump of the isthmus, was the gateway of Rames (of Erane or Eryane) or the Queens, now buried." The Mercure de France(7) reports the testimony of Le Bret who assures that around 1700 an old portico could still be seen, known in the area as the gateway of the Romans. The legend of the executioners working for Caesar(8): "On the rock of Ambarre the executioners performed their dastardly work under the vengeful eye of Caesar. Piles of severed hands, next to the stacks of oak logs, gave the place its name. "Another legend was told in Bretenoux (Lot) to General Creuly (9): "The tradition, as it was recounted to me, tells of an enemy (it does not specify that it is Caesar) who besieged the oppidum. Being unable to take it by force, he brought a herd of goats, with burning firebrands on their horns, down the river Dordogne from Mézels. The inhabitants of the oppidum, in astonishment, abandoned the battleground, and ran down to see the sight, leaving the enemy troops free to climb the mountain. They captured it and cut off the noses of all the people." "I was in Mézels with Armand Teulié, one of my cousins, and Augustin Crasson. The latter, aged 70, was illiterate. In his youth he had been a shepherd on the causse of Mézels, where he had heard the legend that he now repeated spontaneously to us in the local dialect when he realised that the Puy d'Issolud interested us." "Long ago, there was a town on the Puy d'Issolu, and the Dordogne flowed at the foot (of the mountain). When the king explored all around the Puy d'Issolu, he found only rocks, ravines and walls lined with soldiers who, from above, killed his strongest and bravest men with stones and arrows. After three months he had advanced no further than on the first day. When he saw what was happening, he knew that he must find a strategy to take the city, otherwise he would still be there in three years. The king filled a boat with horned goats and on each horn he put a candle. One dark night he set the boat on its way and it travelled down the river, with all the candles lit, towards Puy d'Issolu. When the people saw this spectacle, they all rushed down (to the banks of the Dordogne), wondering what it could be. While they were all talking and shouting, the king's soldiers came from the opposite side and captured the town." Another version, by Paul Bial(11): "The Romans, it is said, surrounded Puy d'Issolud: they were on the rocks of Termes, they were on the Puy de Tours(12), they were on the rocks of the Dordogne, above Mézels, they were everywhere. The town had only one spring and that was drying up, and they fought each other to drink; but the men of the Puy d'Issolud reportedly would rather have died of thirst than surrendered. To overcome them, Caesar, who was very astute, sent down from the heights of Mézels a herd of goats with horns to which had been tied firebrands of burning straw. He filled boats with the goats. The boats floated downstream to the foot of the mountain. It was a wonderful show, and everyone ran to Tourettes and Espioles to see it. Taking advantage of this, the Romans climbed up to the Porte de Rome and took the town. Caesar cut off the nose of all those he caught, but many people escaped via Espioles." On the left of the Porte de Rome (fig. 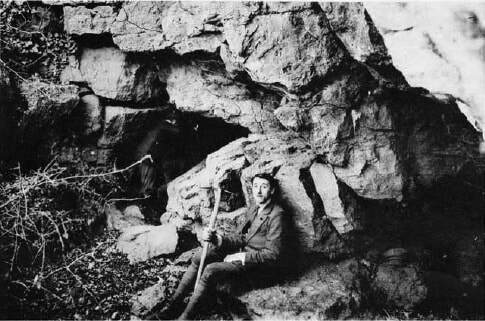 4) going uphill, against the cliff lies the cave called "cave de service" or Servialle (fig. 5). The legend says(13): "Caesar took a "drop" here before returning in triumph to the captured Uxellodunum. In the cave a stock of rum had been left for him. Despite himself he felt fear in the pit of his stomach. This is how the names "cave de service" and even "porte de rhum" have come to be explained. Others say that Caesar was covered there with branches of so-called Roman laurel. A local girl, who he wanted to kiss, despite herself gave him a sprig of thyme laurel, a symbol of the tomb into which he had entered." At pas Rouge(14), the tradition(15) is that on the night of the surrender of Uxellodunum: "The vanquished, wrists mutilated, bloodied this path, seeking refuge in the nearest dwellings. The first poppies of the year appear in these fields." Under the rock of Ambarre (or Embarre) the caves of Crozes de l'Host must lead (according to legend) through the hill to Crozes or Caves de Servial, because it is said that a rooster, introduced on one side, left by the other side having crossed the mountain obliquely from south to north(16). "During the siege of Uxellodunum, on the top of the rock of the Chanteuse(17), a Roman sang all night to annoy and demoralise the gallic troops". - At Parriche(18), there used to be a well which was known as the "well of the severed hands". Another legend, recounted by Henri Soulié-Richard of Bretenoux(19), is related to the marshes around Puy d'Issolud:"Sometime in the past the whole plain was a huge lake, and people place that in historic times. I have heard that it was Queen Brunehault who had caused a rock to fall from the bank, somewhere towards Gluges(20), or at Meyronne, which would have allowed the water to drain away. I heard this from several people who would now be almost 110-120 years old. 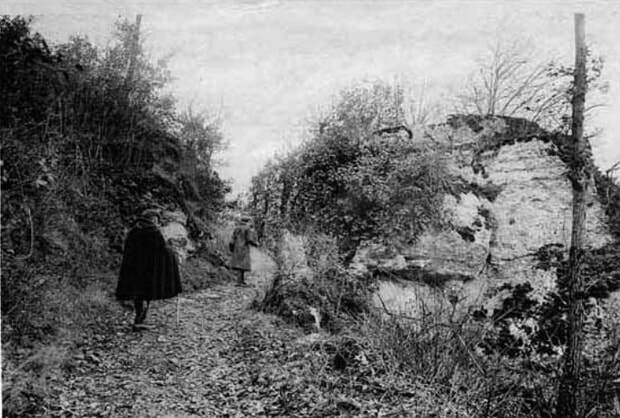 Two of my informants told me that there was in these places "near Gluges" a place called the trou de la Dame, which was the rock plug that would have allowed the lake to empty." On the south side of Puy d'Issolud, Laurent-Bruzy pointed out a menhir (the menhir of Billiri or Billirix or bon roi (good king) or cou de la chèvre (neck of the goat). This is a natural, mushroom-shaped rock, its names associated more with folklore based on the site's history than on a credible origin. 1 - Bial (P.) - Uxellodunum. Besançon, 1859, extract of the Mémoires de la Société d'Émulation du Doubs, p. 29. 2 - Laurent-Bruzy (A.). Carnyx d’Uxellodunum, Puy-d’Issolud (Lot). Histoires et Légendes. Brive, Lachaise, 1933, in-8°, p.81. 3 - Ibid, p. 17. 4 - This legend still persists. 5 - Ibid, p. 27. 6 - Laurent-Bruzy (A.) - Brillie ou la Fille de Luctère, Puy-d'Issolud - Uxellodunum. Brive, Imp. Bessot & Guionie, 1921, p.8-9, 111. 8 - Laurent-Bruzy (A.) - Op. cit., 1921, p. 113. 9 - Creuly (Général) et Jacobs (Alfred) - Géographie historique et topographique des lieux proposés pour représenter Uxellodunum. Paris, Durand, 1860, in - 8°, p. 204. 10 - Teulié (H.) - Siège du Puy-d'Issolu. Rennes, imprimerie Fr. Simon, 1911. 11 - Bial (P.) - Op. cit., 1859, p. 36. 12 - Puy de Toul, north west of the village de Saint-Michel-de-Bannières. 13 - Laurent -Bruzy (A.) - Op. cit., 1921, p. 110-111. 14 - Passageon the east side of Puy d'Issolud. 15 - Laurent-Bruzy (A.) - Op. cit, 1921, p. 113. 16 - Delmond (Pierre). – Au Puy-d’Issolu. Lémozi, 1912, p. 304. Témoignage 1972, Louis Brousse. 17 - This rock is on the south west side of Puy d'Issolud, facing la Verrie. 18 - To the west of Puy d'Issolud. 19 - Legends collected by Martine Bergues on 17 and 24 May 2006. 20 - A village on the south west side of Puy d’Issolud. - Bial (P.) - Uxellodunum. Extrait des Mémoires de la Soc. d'Emulation du Département du Doubs, 3e Série, III, 1859, p. 583. Besançon, Dodivers, 1859, in-8°, pl., 37 p.
- Creuly (le général) et Alfred Jacobs - Examen historique et topographique des lieux proposés pour représenter Uxellodunum. Rev. des Soc. Savantes, Paris, Durand, 1860, III, 2e série, p. 182-217. - Reproduit dans l'annuaire du Lot, 1861. - Delmond (P.) - Au Puy-d'Issolu. Lemouzi-Revue, 1912, p. 301-306. - Laurent-Bruzy (A.) - Brillie ou la Fille de Luctère. Drame tragique en 4 actes. et en vers, tiré de l'histoire des Gaules. Brive, Bessot et Guionie, 1921, 250 p.
- Laurent-Bruzy (A.) - La Légende du Marais. Extraits des " Carnyxs d'Uxellodunum ", Puy-d'Issolud (Lot). Histoires et Légendes. Brive, Lachaise, 1933, pt in-8°, 10 p.
- Laurent-Bruzy (A.) - Carnyx d'Uxellodunum, Puy-d'Issolud (Lot). Histoires et Légendes. Brive, Lachaise, 1933, in-8°, 293 p., 48 gravures. - Laurent-Bruzy (A.) - L'Epée dans la Rivière. Histoires et Légendes. Brive, Lachaise, 1933, in-8°, 7 p.
- Laurent-Bruzy (A.) - L'île des Péchés. Histoires et Légendes. Brive, Lachaise, 1933, pt in-8°. - Laurent-Bruzy (A.) - Mirette. Episodes du dernier jour d'Uxellodunum au Puy-d'Issolud (Lot). - Laurent-Bruzy (A.) - Histoire et Légendes. Brive, Chastrusse-Praudel et Gte, 1935, in-12, 55 p. - Cahors, Coueslant, 1941, in-12, 149 p., 2e édition. - Teulié (H.) - Autour d'Uxellodunum. Le Siège du Puy-d'Issolud. Rennes, Imp. Fr. Simon, 1911, in-8°, 3 p.